To many people, air leakage is a mystery. We know it through the drafts and cold spots in our house during the heating season. What is air leakage, known in the Building Science and Energy Efficiency world as Infiltration? Why do I need to care about it (a) as a homeowner and (b) as a builder or other building professional (Real Estate Agent, plumber, electrician, etc.). Here is a nice graphic which I got off of the internet from a website called: RBC Insulation in Tennessee. It shows some of the major locations for air leakage. 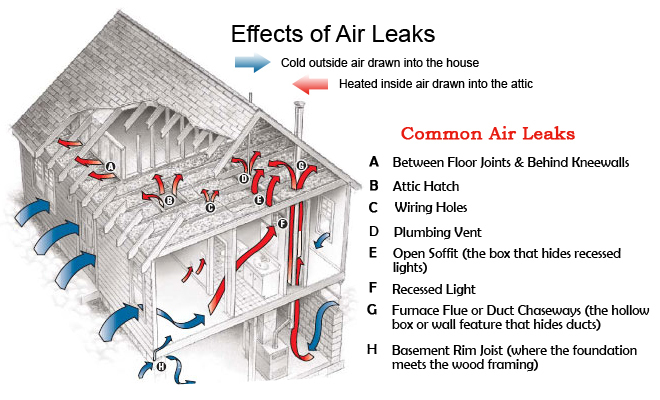 1) The leaks which allow cold, outside air to be blown into the house by wind. 2) The leaks which are part of the Stack Effect, which is independent from wind. Infiltration by wind is pretty easy to get. Wind blows through gaps in the walls, around windows and doors, etc. Many people think that wind blowing on the house is the only part of this effect but it isn't. When wind blows on the front of the house it creates a place of high pressure at the front of the house..but creates a low pressure area at the back of the house (see image from the Building Science Corporation). Here we can see that although air is blowing at the front of the house, causing wind to blow through the cracks, gaps at doors, through porous walls, etc. However what is not so noticeable is that the negative pressure at the back of the house is sucking air out of the house through the gaps at the back of the house. It is a one-two punch accelerating the rate at which warm, conditioned air which you spent $ to heat is being pushed and pulled out of your house. The Stack Effect is caused by the fact that Warm Air Rises (by the way heat doesn't rise, it goes from hot to cold, hot air rises due to the excitement of air molecules). In the Stack Effect the air you are heating up with your boiler or furnace rises to the top of your house, called the top pressure plane. This is usually the ceiling of the top-most floor of your house. 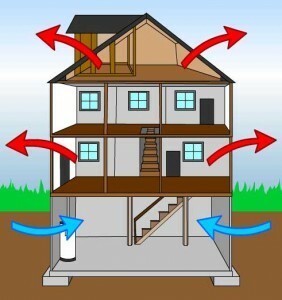 In this image from myhomescience.com we can see how the Stack Effect works. Warm air pushes against the holes in your top ceiling. Recessed lights, top plates of framing, attic hatches and pull down stairs are all places through which the costly warm air can escape your house into the cold Vermont winter (if you live in Vermont). This creates a low pressure in the house (air out=air in). That low pressure is strongest in the basement/crawlspace. Cold, unconditioned (un-warmed) air enters the house through the basement gaps: perimeter joist bays, the walls themselves if they are porous (like rubble walls or hollow core cinder blocks). This cold air is then warmed by your heating system...rises...escapes...pulls in more cold air...etc. etc. etc. We call this type of cycle a convective cycle. Convection is a fluid (in this case air) moving due to changes in density (hot air less dense than cold air, etc.). There you have the two major infiltration losses for a house. There are easy, relatively inexpensive ways to stop infiltration in a house which is being constructed. It is more costly and invasive to fix an existing house, though not prohibitively so. Efficiency Vermont has programs to help evaluate your existing house and a team of vetted professionals who can make your house less leaky. For more information about finding out which pro's you should contact for your existing house visit our Efficiency Vermont page. If you are building a new home and want advice for your builder on how best to make sure it is air tight to reduce heating costs (and cooling by the way) contact a local Passive House Consultant or other BPI certified builder. 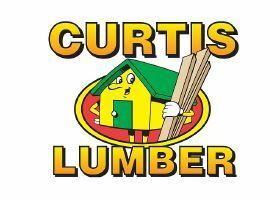 They can work with your builder or suggest builders who know how to do this right.